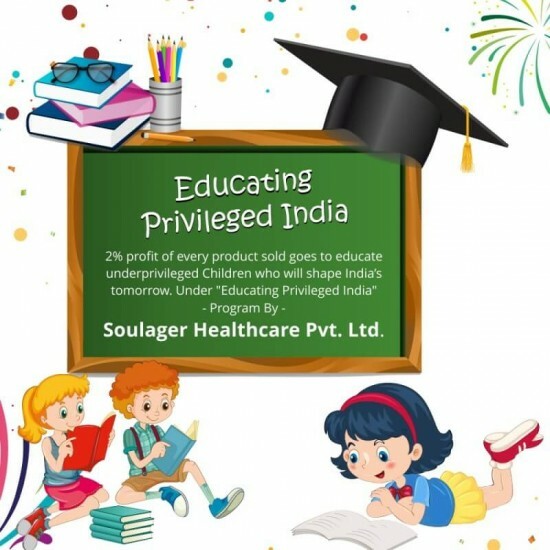 Simply Herbal Joyful Joints - a 100% herbal supplement with 80% HCA plus Green Tea and Guggul extract Joints pain has become so common that it is affecting right from teenagers to old people. This is because the bones are not as strong, be it because of improper diet, no exercise or lazy lifestyle. But taking care of joints is essential for daily activities. People find it difficult to sit for long, work continuously, bend or lift, or have easily fractured and difficult to heal bones. These have long-term consequences of making people weak, out of balance, non-maneuverable and dependent. 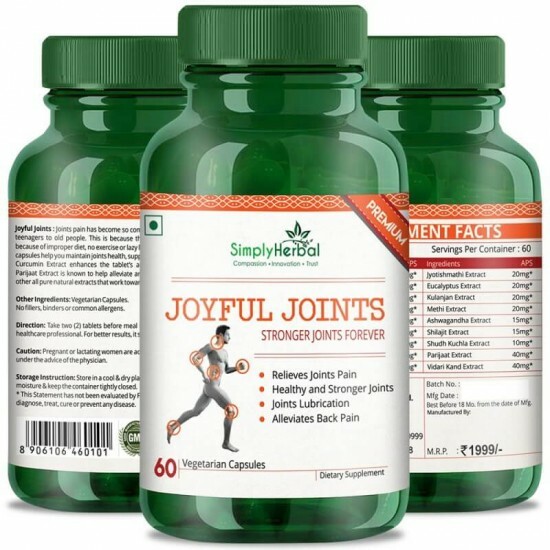 In order to make sure that our customers stay healthy even in the long run, we made Simply Herbal Joyful Joints with all the essential ingredients that keep joints healthy and strong. 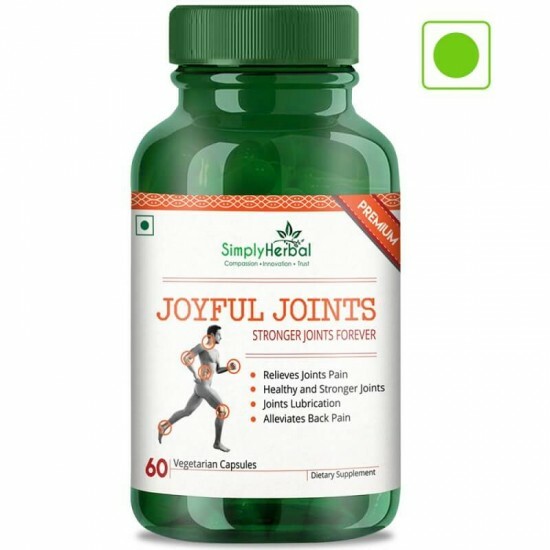 Simply Herbal Joyful Joints tablets help you maintain joints health, support for joint tissue and lubrication. 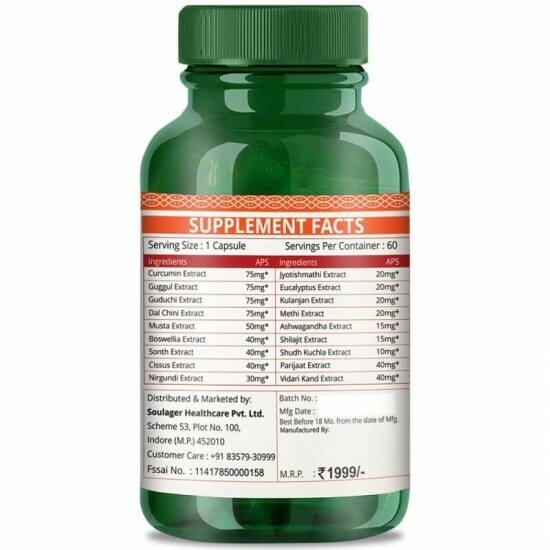 Curcumin Extract enhances the tablet’s anti-inflammatory properties and Parijaat Extract is known to help alleviate arthritis, back, neck pain and many other all pure natural extracts that work towards eliminating joints pain and make bones strong. 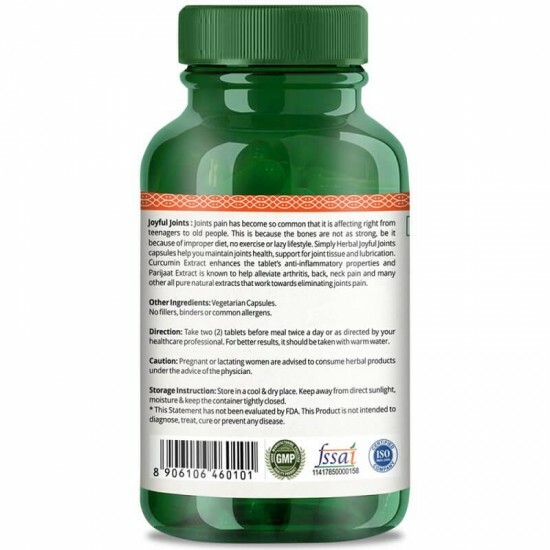 Other Ingredients - Vegetarian Capsules, No fillers, binders or common allergens. Direction -Take two (2) tablets before meal twice a day or as directed by your healthcare professional. For better results, it should be taken with warm water. Caution: Pregnant or lactating women are advised to consume herbal products under the advice of the physician. Storage Instruction: Store in a cool & dry place. Keep away from direct sunlight, moisture & keep the container tightly closed.